Within moments of meeting TC Mathew, his style of doing things is evident. The Secretary of Kerala Cricket Association doesn’t mince words. If he has the option to think of something and also to do that something, Mathew would rather do it first. It is this doer credentials with which he holds his forte among a rising pool of detractors. His opinions are often radical, not to mention that Mathew has an opinion for practically everything under the sun - right from the debacle in Australia to local issues like Kochi Metro. When we met him, Mathew was not alone, and soon we realized that this guy can never be alone. Some other top functionaries of Kerala Cricket Association were there in the room, including one of KCA Vice Presidents, Ronklin John; International Stadium’s Project Head, Jayesh George; and Technical Committee Member, Moby Thomas, to name just a few. Some other office bearers went in and went out, almost throughout, during our interview, and not just doing their official duties. If we expected the interview to be a one-to-one, we were wrong. TC Mathew works in teams. They move together, discuss together. No first-time visitor to Kerala Cricket Association office in Kaloor International Stadium would be at fault to assume that their meetings are more like guy pals partying rather than men-in-suits contemplating the future for gentleman’s game in Kerala. Remember, these are the guys sitting in seats once occupied by stalwarts like PM Raghavan, KV Kellappan Thampuran, and Col. Godavarma Raja, not to mention several illustrious players and IAS/IPS officers who were office-bearers of Kerala Cricket Association and its precursors Tripunithura Cricket Club and Travancore-Cochin Cricket Association, right from 1935. When asked about this, TC Mathew and current KCA administrators are equivocal in praising Kerala cricket’s early movers. But they also admit that after the initial decades, during its mid-history, Kerala Cricket Association lost its steam. We are meeting with the team that is now trying to correct the errors. Are they up to it? Is that why they are being so radical, that they have a radical guy like TC Mathew at the helm? One strategy they have implemented is to turn young. Gone are the days when aged players and retired hands headed the show. We could find that most of them were in their late youth to early middle-age. “This is a just-do-it team unlike in politics,” says, Moby Thomas, one of the youngest in the room as well as in KCA, who heads the Physical Education Department at SB College, Changanassery. Jayesh George who also heads the Ernakulam District Association apart from the Stadium Project is another example. Despite lying in a sofa due to a torn hamstring from a recent bout of Celebrity Cricket, Jayesh is quick to spring to his former player’s feet when it comes to defending Kerala Cricket Association’s pet project, the Edakochi Stadium. Google Earth, a fast broadband, and a slick netbook is not enough to satisfy George’s impatience, as he rapidly shows us how hollow is the argument that Edakochi stadium was marshland a few years back. Most of the present KCA administrators are well-educated, or people who have made a mark in their fields. Unlike in the past, precisely since the last two years, Kerala Cricket Association has also made sure that no one can aspire for top office-bearer positions without handling lower responsibilities at least for two years. Mathew himself was a long-term associate of KCA, before which he was an aspiring player, a qualified umpire, a lawyer, and a double postgraduate in Business Administration as well as Political Science. Also tucked under his belt are twin PG Diplomas in Tax Laws and Computer Science, that contributes to a well-rounded knowledgebase. He also had a close brush with state politics, as he was Personal Secretary to PJ Joseph, a prominent political leader in the state, and currently a Minister in Kerala. Anyway, there is no doubt that Kerala Cricket Association is now facing one of its hardest times ever of public scrutiny and allegations. There are accusations being made about fund misuse by KCA, allegations about unauthorized donations to a political party, emergence of strong political detractors, allegations regarding acquisition of Edakochi land, and not to mention a vigilance case. Let us start with the upcoming Sports Bill. You have been a vociferous critic in recent discussions on the topic. Why so, regarding what is perceived as a good initiative? It is not only my stand. BCCI as well as KCA has a clear stand on this issue. Our national functionaries including Arun Jaitley has made our stand clear. We had been called for discussions after the initial draft, where BCCI made its stand clear, and yet the second draft is hopeless than the first. What are your main objections regarding the Bill? Is it about the RTI provision? Yes, that is a serious concern, though we don’t believe it will be part of the Bill. How can it be, when these sporting bodies are not getting government money? RTI is basically for institutions running on public funds, and yet you see a huge segment like co-operative banks still being kept out of the RTI. So we coming under RTI is impractical. Any other provision in the Sports Bill that BCCI or KCA finds troubling? There are many troubling provisions. One that readily comes to my mind is the proposal for creating a Sports Tribunal. The objective of the tribunal is to direct arbitration between sports administrators and practically anyone in the public. That sets a very bad precedent. Anyone raising complaint in arbitration should be qualified to do so. Have some recognized domain knowledge or experience in the subject. Otherwise, it should go through the normal judicial process. Everyone in public administration today knows the situation unleashed by RTI and PIL. This proposal goes even beyond that. What else is your objection? Well, if you have read the provisions of the Sports Bill, you would realize that it is basically designed to rein in the sports administrator’s activities. Is that a positive thing? We would say not at all. All these noise about the Commonwealth Games has contributed to this Bill. That is not the right way to go about it. Where are the positive points, the innovations? They have a model for sports administrators to follow, and instead of doing it, they are kind of stifling even the best model available. The model you refer is BCCI? Of course. Is there any other model to look upon? Every other sport in India, other than cricket, is in shambles. Why? Because they don’t have proper administrators like BCCI. Every sport has a federation, but what do they really achieve? Our only gold medal in Olympics since the last thirty years is in an individual sport, and that too by an affluent sportsman who was capable of creating his own shooting range as well as in getting overseas training under the best coaches. In contrast, BCCI has achieved not only sporting success, not only commercial success, but succeeded in making cricket the most popular sport in the country. For that argument to be true, BCCI must be following a non-transparent selection process. Not so. We have a professional and democratic system of selectors that goes about doing it job professionally. Do you think any kind of hanky-panky is possible in this age where media as well as cricket enthusiasts are watching our every moves, and sharing the same through technology. We believe that we always select the best team. We may not be perfect, but there is enough room for discussions, reviews, tweaks etc. Even the current team touring Australia is the best one? Yes, it is, under the current scenario. We cant say it is not, just because they had a bad series there. And each match and each series provide continuous feedback to selectors and the system which is taken seriously. Frankly speaking, how do you view the Australian debacle? I think it requires a formal and rigorous assessment. Though many reasons are being said, like use of bouncers, bodyline balls etc, I think it of as a failure of strategy and preparedness. The Aussies were much better prepared than us, this time. It is clear for the discerning cricket fan, that they had made their players well aware of the quirks or soft-spots of our players, probably by making them watch numerous matches closely. There was also a case of superior fitness. I am sure the Indian side will learn the lessons well and thoroughly overhaul our strategy after this series. But where is the scope for oversight? Isn’t that what the Sports Bill attempts to do? Is it a bad thing that there should be public oversight? Again, that will be true only if Government oversight has worked in sports. As of now, the proof is to the contrary. Despite many big promises by many successive governments towards promoting many sports, nothing has worked. Sporting is best promoted and administered by its enthusiasts, their clubs, and their apex bodies. Sports administrators always have the structure of a cooperative movement. Will a cooperative works against its ultimate aim? Similarly, BCCI won’t be ever working against its own and only aim - promoting Indian cricket. Well, maybe that is one way of looking at it. But BCCI is never saying that no one else can promote cricket. Anybody is welcome to do it. But when it comes to administering it, there should be some system. As early movers, BCCI naturally occupied and continues to occupy that spot. Anybody earnest about promoting and administering cricket is likely to come through this elaborate system of district, state, and central level hierarchies that are working fine. At the end of the day what counts is not whether we are a monopoly or not, but whether we are doing our duty, meeting our objectives. A few minutes back you mentioned BCCI being a commercial success. But is that simply because of BCCI? How can you not credit factors like cricket being a professional game, and not an amateur one internationally, and regarding your success in India, is it not because we have the maximum eyeballs? Yes, there are those factors. Cricket has money in it. It needs money, it earns money. It is not only here, but in all cricket playing nations. Today, BCCI earns the highest revenue among all national cricket boards. Was it only due to eyeballs? If that were the case, hockey has been so popular a few decades back that it was made our national game, and even today football is so popular in the country especially during the World Cups. But does that mean we have an internationally respectable soccer team? The situation is far from it. So, the fact is Indian cricket’s success is not only about money or eyeballs, but about proper administration. There is money available for facilitation in every sport, provided the administration is good. For example, I see a bright future for soccer in this country, provided the administration is beefed up. Coming to Kerala Cricket, why is it that Kerala is lagging so much, compared to other states? Well, I am tempted to tell you first that we are not lagging any more. But before that let me try and explain why this has been so, until recently. I personally think that there are three aspects to this problem. One is that awareness about cricket in our state has been pretty poor some ten or twenty or thirty years back. There were cricketing clubs, but they were elitist, and the game itself was thought to be for the rich, maybe due to the high cost involved. But I would put one big blame for this with our physical education departments in schools and colleges, that did not take that little extra effort to learn this complex game themselves. So, they brushed aside students’ doubts regarding the game. Secondly, our state has a weather problem. Around half of the year it is raining, and as you know cricket and its pitches are very much affected by rain. Half of the remaining months it is scorching hot. Hopefully, better technologies being tried now in stadiums and pitches will help us on the weather front. And thirdly, the lagging was due to less than perfect cricket administration. The selection process was not very inclusive to bring out the best. Can you elaborate on this second point regarding selection? Yes, the selection system that was in force around 5 to 7 years back, was about selecting 22 players from say around 220 players, which gave a high probability of around 1-in-10 chances for a serious cricket aspirant getting into the state team. During that time, the best performing states on the national scene was selecting 22 players from 2000 aspirants. That ensured that those coming through such a system was far superior than our players. But since the last 5 years, we have also adopted such an elaborate system to identify, groom, and select 100 or 200 times the number of players than our state requires finally, right from high school onwards. And we are with them through their various stages of schooling and college, until they are 21. You say this system has been in place for 5 years. Has it started yielding results? Of course. You should remember that we started by identifying talents young. So the first results are likely to be in the Under-14, Under-16 categories. And that is what is happening now. The Kerala team in both these categories are doing extremely well, compared to the past. We narrowly missed qualifying for the Under-19 finals, but it won’t be the case next time. Eventually, we will conquer Under-21 too, as these talent pool get more refined. How did Kerala Cricket Association go about creating such a system? At the crux of this is a written down vision statement, which we call Mission-2020. It is a master plan that is elaborated through 16 constituent objectives to change the very prospect and profile for this game in the state. It would be difficult to describe all these 16 points now, but to give you a sampling, I will mention a couple of these objectives. One involves the creation of multiple venues for first class cricket in all the fourteen districts of Kerala. When we said this initially, many were sceptics. But we have proved that it was no hollow promise, by tying up with colleges and schools with excellent infrastructure and by assisting & funding them, we have already made a head-start. For example, in Ernakulam, we have upgraded the stadiums at Rajagiri Engineering College and St. Paul’s College to wonderful effect. Several such college and schools stadiums in all the 14 districts are being assisted with upgradation. Another objective as part of Mission-2020 was to create enough Cricket Academies in each district. We started off with Academies in Trivandrum & Ernakulam, and today we have 21 Cricket Academies, where 336 identified talents - both boys and girls - are being trained intensively. A few more Academies will also come up. Another objective is creation of more than one cricket hostel in all the 14 districts, which has also made much progress. Similarly there are 16 objectives in Mission-2020. How has been the response of young talents and their parents towards this ambitious plan? But before that let me tell about the talents themselves. We ourselves have been surprised by the kind of young talent in the state, which was uncovered by this program. Even the first students we selected after rigorous tests and screening were very impressive in their abilities. That spurred us on to extend this program and selection to a much bigger scale. They too are extremely happy as we take care of the entire funding, professional coaching, physical training, Psychologist assistance, Gymnasium, good general education, lodging etc. We are also doing a lot to develop women’s cricket, by bringing more girls into our academies. Are there similar programs in other states? How do you compare? There are similar programs, but not this ambitious and from a grassroots level. We were lagging, so when we created something, we were impatient, and we have given only 10 years to ourselves to achieve these high objectives. Both BCCI and NCA officials have visited our facilities, and they were very impressed. Our best endorsement came from Sandeep Patil, former national player and Director of NCA now, who remarked that other states should follow the Kerala model. Many other states that were lagging like us, have now adopted our grassroots level approach and model. How do you assess the talent and the current form of Keralite players at all levels, including Sreesanth, Tinu Yohannan, and others? They are all very talented and good boys too. Tinu has now settled in Chennai and is pursuing his career. Sreesanth will bounce back from his injury and we have good hopes on him. Sony Cheruvathur and Sanju Samson are other very talented players. We also have more than a few talented players like them. But one thing we need to correct in our system is the optimum timing - our players should be at their prime in the optimum age so that they will be nationally noticed. The integrity of our players is above par, they don’t correct their age in records or stuff like that. That sounds strange. Are there players in other states resorting to such tactics? Well, it seems so. Looking at the kind of players coming to play with our Under-19, Under-22 etc, one can’t help wondering. I think there are similar allegations on the national scene too. But it is for the respective associations to take notice and discourage such practices. Do you think Kerala players like Sreesanth or Tinu were sidelined by national selectors? No, I don’t think so. Indian cricket is an affair of abundant talent, and hence very competitive. It is very difficult for any state to have even one stable player in the Indian team, given that we are now 35 states and union territories. That is why our Vision 2020 statement has set the objective of developing at least one international player who can be consistently in the Indian team for at least 5 years. Do you think the selection process at each level in the state is fair and transparent? I think it was reasonably fair, especially at the senior levels. But that is not enough. We wanted it to be more professional, near perfect. That is what has been achieved now. Nobody will get a walkover into state or district teams at any level. The method being used for this is exponentially increasing the number of competitive games the players get to play. The performance in hundreds of games will be tracked and evaluated by the selectors to come up with the best teams for each level. And at each level we will be selecting more than double the required players, so that even after the selection, nobody’s place will be assured, but hard-earned due to their performance in the final camps. Can you specifically list out this new system’s achievements on the competitive or performance side? Yes, as I told you before, there are enough achievements already at each stage. For Under-14, we are South Zone champions. For Under-19, we have been in the ‘Elite’ league since last year. Coming to Under-25, we were second in South Zone. And coming to Renji, we missed being in the Elite league by just 1 point. You spoke about the better way in which players are being selected now in Kerala, at every level. What about the support system like infrastructure and officials? Well, there too we have made rapid strides. We now have the second or third position in the number of Level A coaches. For advancing in the Level B stage, we have recently hired a noted coach for our Academy from Bangalore, who was training students for an international school there. Similar is the case with our focus on physios, curators etc. We have a good support system now. The way our system is being built up has proven that we are trendsetters. The same model is being tried now in Nagpur, and we expect more emulations of our Kerala model. What is the status of the Edakochi Stadium project now? As you know, as things stand now, it needs an Environmental Clearance from the Centre. It is unfortunate, but that is the way things are in our state. There was the widest possible consensus regarding the selection of the site and the project’s initial steps from all authorities and democratic bodies, but a few people could still play mischief by raising wild allegations against us and the project. But we are so determined about the project, and have done so much hard work for it, that we won’t abandon it ever. But our current priority is to develop the stadiums in other districts before we re-visit this project again. The Edakochi site was not a marsh land ever, as Jayesh George would show you now in Google Earth. You should remember that this issue is being raked up, even while acres of marsh land are being freely converted into commercial development in this very district. We will fight it out. How do you view the allegations regarding entrusting the Edakochi stadium work to one party and later revoking it when queries were raised? That is a totally fabricated allegation. Who entrusted the stadium work to IVC? We haven’t. If we had, we would have paid them some advance. A section of the media is totally convoluting this issue. We had signed just an MoU with them to procure land, and entrusting the work to them arose only if they fulfilled our many conditions, which mainly involved getting requisite clearances. But they didn’t fulfil any conditions after procuring the land. And the land was not theirs. They just helped in identifying it. Our only contract in this affair is with the landowner. We have securely bought the land at very attractive prices, and hence it is a high-value investment too for Kerala Cricket Association. We can’t help if IVC, instead of fulfilling the agreed upon conditions, decided to gang up with some of our enemies to raise wild allegations. We have a solid legal case and we will fight it out successfully. How far did the stadium plans proceed before the bar from environment ministry came? We had brought in Sir Michael Hopkins, one of the this globe’s most renowned architects and stadium specialists for this project. After visiting the Edakochi site and reviewing our rough plans, Sir Hopkins had remarked that this holds the potential to be world’s finest stadium. Coming from a celebrated professional who designed the London Olympics Velodrome (2012), not to mention cricket stadiums like Mound Stand at Lords, Hampshire Country Cricket Club, Chepauk Cricket Stadium, MCA Pune International Cricket Centre & Stadium etc, this was real appreciation. Such is the scenic possibilities of the land and our plans. Personally speaking, I used to note down the best innovative stadium features from wherever I travel, and I was instrumental in suggesting the A/c-non-A/c concept when a couple of stadiums were refurbished. Anyway, we are waiting for the environmental issues to resolve before going full-steam ahead. You were planning to bring in some IPL matches in the coming season. Will it be successful? Though we have done our best, and we also had the blessings of our Chief Minister for the same, it is not entirely in our hands. Ultimately the Chennai and Bangalore teams which we tried to host should be agreeable to this. According to me, they wouldn’t have any problem except our summer heat. Let us see, I am still hopeful. Will you ever see the Kochi IPL team being revived? Do you think KCA could do its best to assist them? As you know, the future of Kochi Tuskers will be decided as per the arbitration going on. Let us hope the Tuskers can be revived. Whether we will have another team is a distant possibility as of now. The main problem is funding, as the break-even for this huge investment can be more than four years. We don’t have such industrialist sponsors here. The last experiment was basically by a group of Gujarati businessmen, and they themselves lacked a cohesion to persist. They were not very committed to Kerala too. Though we did our best to assist them, there was obviously limits to our help, especially when they weren’t communicating properly their issues. Compared to Kerala, a metro like Mumbai, Chennai, or Bangalore is much more capable of making an IPL team viable. But we can’t overrule the possibility absolutely. Kerala Cricket Association will definitely do its part if any sponsor comes forward. How do you view initiatives like Celebrity Cricket? Spreading awareness about cricket is a crucial aim of KCA. We think Celebrity Cricket too can help significantly in gaining ground support for cricket. Look at the turnout for their match at Kochi. That is why Kerala Cricket Association supported this initiative, and in the future too the association will continue to support such unique initiatives to promote cricket. How far will Vision 2020 succeed in cricket being a grassroots movement in this state, in the decades to come? Yes, there is no doubt that change has to start from the grassroots level. Vision 2020 plans to create grassroots level momentum through an ambitious program called Cricket@School. It is different from our Academies, something that will complement our academy system. The idea is simple - creation of a cricket team for each school. Today, only a handful of schools have cricket teams. That should change. Kerala Cricket Association will facilitate this change for schools. Many already have infrastructure. Many require only fine-tuning of facilities. From coaches to consultancy, we have created a formal framework for schools to pursue cricket. Very enterprising PR exercise, I must say! How does Mathew, 'the doer', explain the undertaking taken from the Edakochi land seller (the LIS group)that 'NO FISHING RIGHTS HAVE BEEN AWARDED TO ANYONE IN THE AREA'? Does Google Earth reveal any clue about it to Mr. Jayesh George? And why was Mathew not questioned by the Interviewer regarding the donations to political parties -another 'wild' allegation? A closer look at the MoU signed with IVL by the KCA will reveal that it is a two-part MoU involving both land purchase and construction. Who are this 'dashing team' think they are kidding? The discerning elements in Kerala cricket -enemies in Mathew's language- know very well that this is anyway just the tip of a massive corruption iceberg. 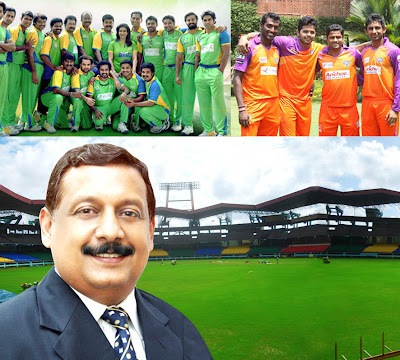 I recently came across a feature on TC Mathew , the current KCA secretary of Kerala cricket association. I'm a former Ranji Trophy player - Opener of the Kerala Ranji Trophy Team. I'm also the Grandson of PM Raghavan, one of the founder members of Kerala cricket association who is mentioned in your article. I have been a former captain of the Kerala Under 22 cricket Team and also represented the South Zone India under 16 and Under 19 Teams. From my personal experience ,I can tell you that KCA is one of the corrupt associations where a no. of key officials have been plundering away public wealth .All the top former cricketers of Kerala cricket such as Tinu yohanan, Sree santh, Ananthapadmanabhan are fed up of the Opaque and corrupt ways that has been responsible for destroying the cricket eco system of Kerala. Recently the KCA came out with a amendment that prevents even a former Ranji Player from contesting for elections. The current central council of Kerala cricket association which is the executive decision making body of Kerala cricket does not have any a single player who has played first class cricket. This is because the current lot has monopolized the postions for their personal gains. 6 out of the current 14 associations are adhoc associations that were created out of bogus clubs. The going ons in Kerala cricket are enough to make the blood of any ethical , well educated person boild. Many of the facts mentioned in the article have been taken on face value of TC mathew. I really doubt this man's integrity. It's a real let down to see your esteemed magazine take out a feature on a person who can be termed as the Suresh Kalmadi of Kerala sports. Please find below a recent article in the Hindu that has Kerala cricket legend speaking out against the unjust selection policies in Kerala cricket. Former Kerala Ranji Trophy captain K.N. Ananthapadmanabhan has allegeded large-scale misuse of power in the selection process of various age-group teams by the Kerala Cricket Association (KCA) and its affiliated district bodies. Sharing the contents of the letter with The Hindu on Wednesday, Ananthapadmanabhan said it was only normal for all associations to give equal opportunities to all players, particularly at a younger age-group, rotating the players so that they got to play at least two or three matches. KCA president T.R. Balakrishnan was not immediately available for comment.